Moving in & how to travel knit. Hey there! Finally got moved into our cute Portland apartment, and loving the city so far. I can’t wait to do some reviews on the shops around here. It’ll be hard though not to focus on all the pubs right at the corner of my new home. Hehe. 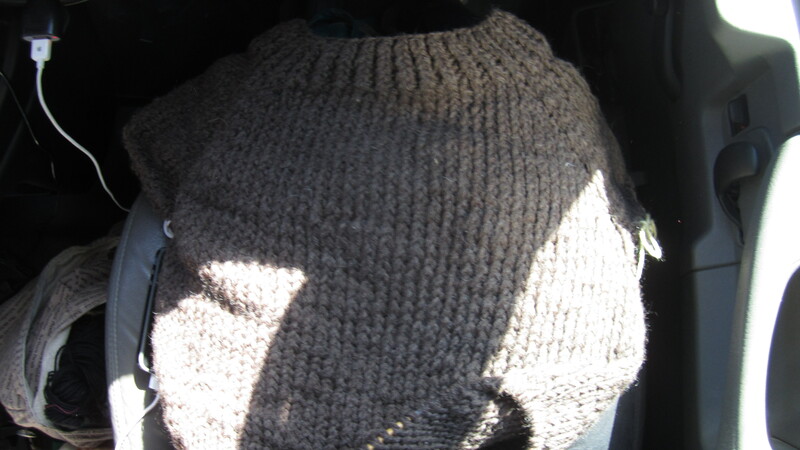 Well of course I grabbed some knitting for the road. This is always a really difficult decision to pick what to take with me to work on. I almost feel as I am picking favorites and leaving the other half empty skeins of yarn all alone in their drawer. I thought I’d give some tips on what to pick to take, and what supplies should go along. First off, make it an easy pattern you have memorized, or one with just a page or 2 of instructions. You really don’t want to lug around a book! Next, pick something that isn’t always slipping off your needles. Nothing is more annoying than realizing half of the stitches fell off, and 4 of those are unraveling down. Ugh! And of course, make sure you actually enjoy it and doesn’t take too much concentration. Along came the mystery of..why is the end in a loop? That’s right, it wasn’t 2 loose ends. I guess I may have just..umm..yeah I can’t really think of any reason for this. It may have been good though since the Fiance was driving a 16′ truck with his car towing behind up and down curvy mountains. Eep. Anyways, this was a great trip knit cause it qualifies under all 3 rules: I freestyled this with the help of a simple tutorial on raglan sweaters. 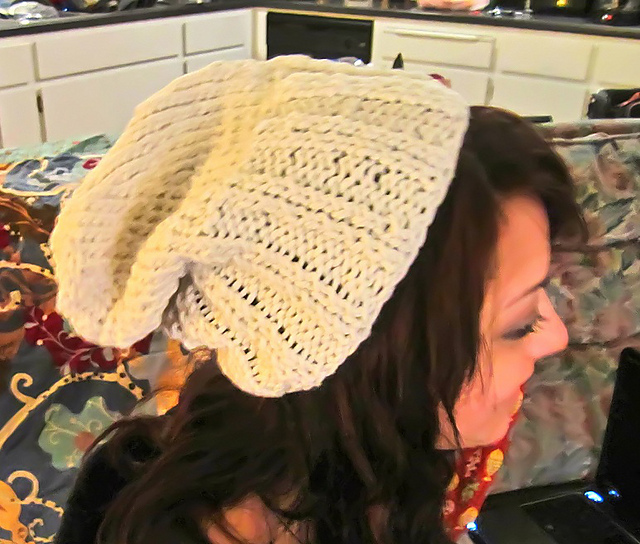 The bamboo needs make it perfect for the stitches NOT to slip off, and since it’s all Stockinette stitch, and just a few decreases, it’s pretty easy to keep track of what’s going on. Extra skein of yarn – or you’ll end up like me. Threading Needle – You may finish, and when you do, you’ll want to weave in everything! Scissors – Keys do not cut yarn well…trust me. 1 more small project, so if you get bored with one, you can switch it up. Extra stitch markers. 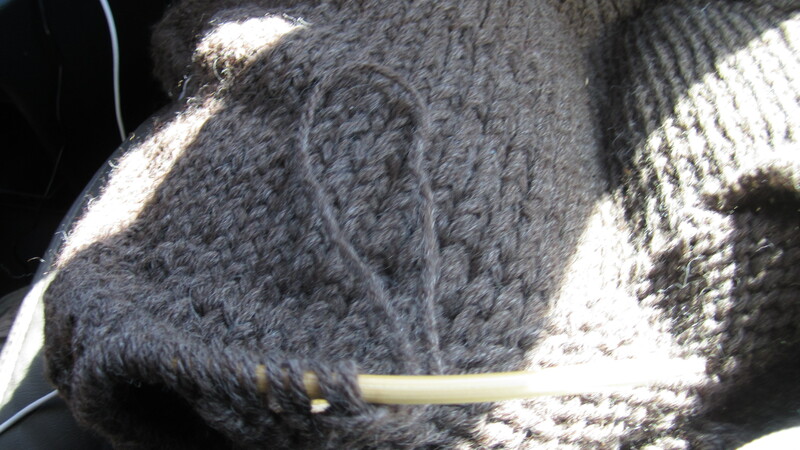 I’ve had many casualties knitting in the car. Measuring divise for when you need to “knit 5in then proceed to next instruction” patterns. Well now were are almost fully settled in our little apartment, but of course there’s still 849323890432 things going on in my life. Gotta explore Portland, then find a damn job in Portland. Plus still get some details down on the wedding..like, send invitations. Whee! Alright, I will return!